Photo taken at KOFA Mts., Yuma Co., Arizona. This photo is also hosted in full resolution at Wikipedia. 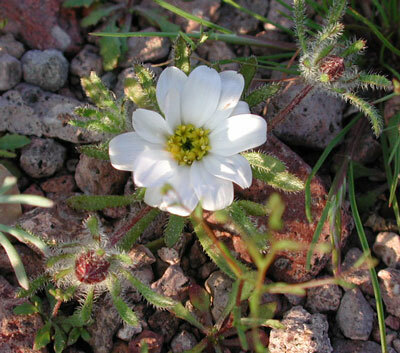 RANGE: Fairly common throughout the lower elevations of the Sonoran Desert particularly on 'desert pavement'. SIZE/FORM: This dwarf annual grows prostrate to the soil rarely reaching more than a few centimeters tall or in circumference. FLOWERS: Although the inflorescence consisting of dozens of smaller flowers is barely the size of a dime, by comparison to the whole plant, it is huge, approaching the diameter of the whole plant. The ray flowers are white in color but may turn pink or even light blue with age. The disc flowers are yellow. Each of the rays and each of the yellow bumps on the disc are separate flowers. Flowering occurs early to late spring only in years with adequate rainfall. FRUIT: Each floret of the composite flower develops into a single-seeded fruit, or achene. Copyright Michael J. Plagens, page created 18 July 2007.